If you are pregnant, or know someone who is, please read this. This is Leo. He is a miracle. Most people have never heard of Vasa Praevia, and due to its rarity, thankfully most people will never experience it. Yet knowing about it could save your baby’s life. My 20 week anomaly scan revealed that I had Major Placenta Praevia. A further ultrasound at 32 weeks highlighted that in fact I had Vasa Praevia, an extremely dangerous and mostly undetected condition, also known as “the secret baby killer”. This very rare but frightening condition occurs when blood vessels from the placenta, which carry the baby’s blood, grow across the cervix. Sometimes, and in my case, the situation is worsened further by the umbilical cord being attached to these fragile vessels, rather than being planted in to the placenta. When pressure is applied to these vessels upon engagement, or when labour begins, the vessels rupture, causing rapid fetal exsanguination. The womb has essentially become a death trap. Following diagnosis I was immediately admitted to hospital and spent a lot of time trying to find good news stories & happy outcomes. There are very few, as looking for Vasa Praevia is not part of routine general screening, which means that 95% of Vasa Praevia cases are not detected until birth, when it is too late. Of the few survivors of undiagnosed Vasa Praevia, many live with life-threatening & debilitating physical & mental illnesses due to the unanticipated complications encountered at birth. I found this lack of success stories and prevalence of devastating information overwhelmingly distressing, so firstly I want to let people know that with a diagnosed Vasa Praevia the likelihood is that their baby will be fine! In fact, 97% of diagnosed Vasa Praevia cases result in a healthy, live baby. So why, when identifying the condition antenatally is simply the difference between life and death, is it not general practice to screen for it? Sadly there are not enough cases to make looking for it cost efficient, yet as many cases are not properly recorded, with deaths being put down as “multiple organ failure” or other such consequences of the condition, there could be more than we officially know about. Yet even the estimated figure of 528 Vasa Praevia deaths per year equates to more than 1 baby’s life lost every day! Essentially, due to its rarity, not enough research has been done to provide convincing evidence for the costs of training & routine screening to be justified. Due to this, a recent study revealed that 40% of sonographers admit they wouldn’t be able to identify Vasa Praevia if it were apparent on a scan anyway. This situation has to change. Training needs to be done, awareness increased, & research carried out so that we have real figures & can confidently know the true number of incidences, in order to influence guidelines & change general practice so that it looks for Vasa Praevia & can act if detected. 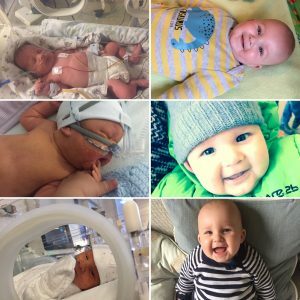 Yet this change is not going to come about easily because diagnosing more cases would also lead to far higher costs when management of Vasa Praevia is taken into account: After my diagnosis I was admitted to hospital and spent weeks being intensely monitored before Leo was delivered by C-section at 36 weeks. 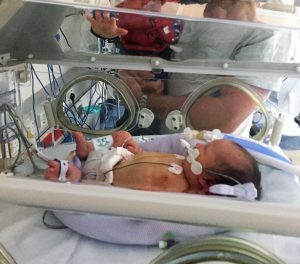 Among other problems associated with prematurity he suffered a collapsed lung as he simply wasn’t ready for his early arrival. 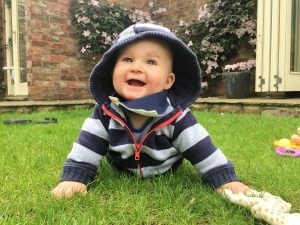 He was transferred to Leeds Children’s Hospital (as was I, remaining a patient myself for another week following complications during the operation) and then back to Harrogate’s Special Care Baby Unit once he was stable again (huge thanks to Embrace baby ambulance teams). It was still far safer for him to be out rather than in, but also far more expensive for the NHS. The costs of all this are considerable, yet currently only 5% of people with Vasa Praevia are incurring these costs. Managing the other 95% would simply demand too many resources. How do you tell that to a parent who’s lost their child in an avoidable tragedy? Therefore research also needs to be done to establish the best way to manage Vasa Praevia so that we can afford to save more Vasa Praevia babies’ lives. A doctor recently told me I was phenomenally unlucky to have had Vasa Praevia & the particularly rare degree of it that I did, but I believe I’m one of the luckiest people on earth as it was spotted despite it not being part of routine screening, & my son is a “Vasa Praevia Survivor”, a very rare phenomenon in a subject that daily speaks of “Vasa Praevia Angels”. It should not be luck that decides whether you are one of the few who are diagnosed. This is an extremely rare condition, but if you are pregnant, or know someone who is, please insist that Vasa Praevia is looked for & don’t listen to people who say it’s not necessary. Even go for a private scan if you possibly can. The huge likelihood is that you don’t have this very uncommon complication, but if you are the 1 out of 2,500, like I was, it can save your baby’s life. Please tell friends & family & help raise awareness of this rare but devastating condition. Babies don’t need to die at birth & parents don’t have to live with such a heartbreaking loss due to Vasa Praevia. It MUST become standard practice to screen for it & for medical professionals to know more about spotting & managing it. The good news is that more hospitals are looking for Vasa Praevia as the technology becomes more widespread and more clinicians fight to raise awareness of the condition, so hopefully one day it will become part of standard practice to check for it. In the meantime, please spread the word and let’s give these babies the life their mothers have spent 9 long months excitedly preparing them for.